Columbia Business School seeks to provide a truly global business education that lasts and evolves over a lifetime, preparing students for strong leadership in any industry. Our cutting-edge curriculum bridges pioneering academic theory with industry practice, imparting not only functional skills but also the entrepreneurial mindset required to recognize and capture opportunity in a competitive business environment. The School offers MBA and Executive MBA (EMBA) degrees, as well as non-degree executive education programs. For more information, visit www.gsb.columbia.edu. A serious record of leadership and achievement is what distinguishes Columbia MBA candidates from other graduate business students. To determine a candidate's eligibility for the program, the admissions committee reviews academic transcripts, test scores, recommendations, personal essays, and background. Admission to Columbia is highly competitive,...A serious record of leadership and achievement is what distinguishes Columbia MBA candidates from other graduate business students. To determine a candidate's eligibility for the program, the admissions committee reviews academic transcripts, test scores, recommendations, personal essays, and background. Admission to Columbia is highly competitive, with only about 15 percent of applicants receiving an offer of admission. In recent years, incoming students had an average GMAT score of 713, with the middle 80 percent ranging from 680 to 760. Surrounded by fascinating classmates and a vibrant metropolis, Columbia students enjoy a “very active social scene” both on and off campus. “During the first semester, there’s a lot to juggle between schoolwork, meeting new people, and recruiting,” but “life becomes exponentially better each semester.” From happy hours to speaker events, students could “attend at least one social event every single day of the two-year program without having to plan or organize anything.” Among the most popular events, “On-campus happy hour on Thursday is a highlight of everyone’s week.”Despite an enrollment of more than 1,000, “Columbia has a strong and tight-knit commu­nity,” comprised of students who “are very fun but also driven to succeed.” On this diverse campus, “students are generally great people to hang out with socially and in the class­room.” Despite the demands of coursework, “Most everyone is involved in the social life, from people with families to single folks.” Without a doubt, “Being in New York also makes for an amazing experience, since we are always going to new places in the city, and it seriously never sleeps.” If CBS students have one minor complaint about their environ­ment, it’s the lack of a “better library and student studying spaces” on campus. However, the school is currently planning its move to the University’s newly developed Manhattanville campus, which will address the shortcomings of the current space. With a top name and a rock solid education to back them up, Columbia graduates enjoy “excellent career opportunities” in New York City and beyond. Through the Career Management Center (CMC), “recruiting does start day one, and it will be intense through­out the two years.” However, students are incredibly impressed with “how hard the CMC will work with you as an individual to ensure placement.” To help counteract the madness of the job hunt, the CMC offers a four-session job strategy series for first-year students, as well as individual advising sessions. In addition, there are “tons of alumni and profession­al mentors available for coaching” throughout the graduate program. Competition is min­imized, and “while recruiting is an extremely rigorous process, particularly in finance and consulting, students are extremely supportive of each other and work together to accom­plish mutual goals.”“All the best companies are a stone’s throw away from you” at Columbia, and graduates consistently score plum positions in New York. The school’s top employers include Amazon, American Express Company, Bain & Company, Barclays, Boston Consulting Group, Booz & Company, Citigroup, Credit Suisse, Deloitte Consulting, Deutsche Bank, Goldman, Sachs & Co., Google, IBM Corporation, JPMorgan Chase, McKinsey & Company, Microsoft, Bank of America Merrill Lynch, Morgan Stanley, and Unilever. More than 40 percent of graduates work in finance, while another 30 percent take jobs in consult­ing. 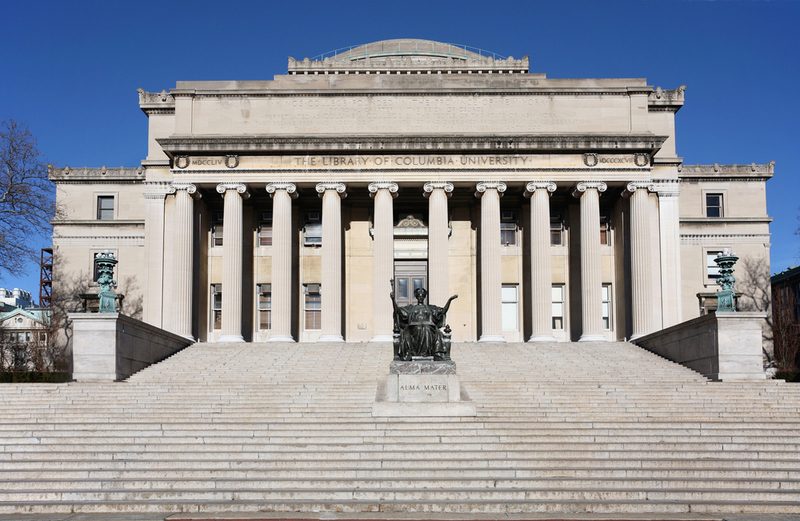 The average starting salary for Columbia graduates is well over $100,000 annually. A Columbia Business School MBA gives graduates the edge in a world that demands smart, flexible, effective business leaders. The MBA program fosters an entrepreneurial mind-set aimed at identifying and capturing opportunity—the stuff of which business leaders are made.Columbia Business School maintains one of the strongest corporate recruiting programs,consistently ranking among the top five favorite hunting groups of corporate recruiters.The school's location and relationships with New York's largest firms and industry leaders create unique opportunities for students.The school boasts a worldwide network of more than 35,000 alumni,some at the highest levels of business. Each entering class is divided into clusters of approximately 60 students who take every course together for the first year of the program and overlap regularly thereafter.A vital reference group, the clusters form a vital reference group throughout the MBA experience.Like the larger school community, clustermates provide a lifetime of friendship, professional advancement, and inspiration. Upon completion of the core, students may choose from more than 150 elective courses at Columbia Business School and supplement them with more than 4, 000 graduate-level classes at 12 of the university's other schools, including the Graduate School of Arts and Sciences, International and Public Affairs, Journalism, Law, and Social Work. The strength behind the program is the distinguished, innovative faculty that includes the 2001 Nobel Laureate for Economics, Joseph Stiglitz. Columbia's faculty includes Fortune 500 professionals, who excel at showing their students how to apply knowledge to any business challenge. Cluster Q: http://www.gsb.columbia.edu/students/organizations/clusterq/index.html Cluster Q, the lesbian, gay, bisexual and transgender business student club at Columbia Business School, exists to foster a positive environment and build a professional network for its members. We make a difference by increasing our visibility, educating our colleagues, raising awareness of queer issues and preventing discrimination. We facilitate networking between existing students and alumni, with students at other business schools and with professionals in the LBGT community at large. Lew Frankfort - Chairman and CEO, Coach, Inc.
Henry Kravis - Founding Partner, Kohlberg Kravis Roberts & Co.
Warren Buffett - Chairman, Berkshire Hathaway Inc.
Want more info about Columbia University, Columbia Business School Executive MBA? Get free advice from education experts and Noodle community members. I'm looking for a full scholarship since I can not afford the tuition fee. Are there any available here? The total tuition cost of the Columbia Business School Executive MBA is $168,480, a large sum even for someone who has been in the workforce for many years.